The Wait for Remote Computer action waits for something to happen to a remote computer. For an overview of "Wait For..." events, including specifics of the Wait Options, see the Waiting For Events topic. Enter the IP address or hostname or a remote computer. Check the "Fail if this host name cannot be found" box if you want the action to fail if the host name cannot be resolved. At each polling interval, FinalBuilder will send a single ping packet to the remote computer (or any other remote network device.) If the remote computer responds, the action will continue. Set the ping packet timeout to the maximum length to wait for a single valid reply. Important: Note that responding to pings may not be a good indication that a computer is fully functional. While a Windows machine responds to pings quite early in the startup process, a given service may not come online until some time later. Using a Control Service action, or the WMI available and process running option, may give a more accurate picture of remote computer's status. Alternatively, use a Delay action to pause after the Wait action finishes. At each polling interval, FinalBuilder will attempt to connect to WMI Services on the remote computer and verify if a given process is running. Optionally, you can set the action to ping the remote computer before connecting via WMI. 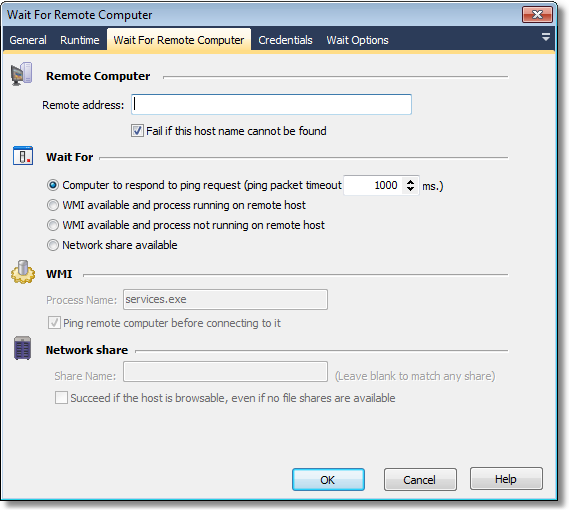 This can be a good idea, as WMI requests may take a long time (up to a minute) to time out if the remote computer is inaccessible, and during this time the action cannot time out or be aborted. Similar to the above option, the action will wait until the named process is not running. Note that if the computer shuts down, this condition will time out without passing (WMI must be available.) Similarly, you can set the action to ping the remote host before attempting a WMI connection. The action will succeed when a given shared folder (or any share) is available on the remote computer. Leave the Share Name blank to match any share. If matching any share, choose the Succeed if network browseable, even if no shares available option if you are only waiting for Windows networking to come online, and do not care whether or not any resources are shared.